Serenity Now: ::Weekend Bloggy Reading:: Link Up! ::Weekend Bloggy Reading:: Link Up! Welcome to my Weekend Bloggy Reading link party. I hope you'll link up your best post of the week today, and maybe leave me some comment love. Please be sure to read my guidelines before you add a link. Do You Have a Messy Space? Time to link up your best post of the week! No items for sale, shops, etc. and please don't link up the same post week after week. Remember this party is for your best post of the week. Don't link up 10 posts...that's really not in the spirit of this party. Visit some of the other links--that's how a good blog party works--participation! Party is open until 10 pm (ET) on Sunday night. What are you up to this weekend? My birthday is tomorrow, but I don't know that we really have any plans for it. Tough month combined with the fact that T will be working all day. Maybe I'll treat the girls and myself to a donut in the morning. Did I Feature you today? Click here for a "featured" button for your blog post or sidebar. The Peonies lamp is gorgeous! Thank you for hosting, Amanda! Thanks so much for hosting Amanda! I actually had two posts to link up this week...and my video post was kind of inspired by the one you shared yesterday. Or at least watching your's gave me the courage to try and make one:) I hope you have a great birthday tomorrow! Hope you have a great birthday - I think you deserve a donut or two! ;) Linking up for the first time - thanks for hosting! I'm all linked up and off to visit some new blogs. Happy Birthday Amanda! Enjoy the weekend. Thanks for hosting the party here. I am having a great time! Happy birthday girl!! Hope you have a wonderful weekend and thanks for hosting again! Amanda! You at LEAST need a donut on your birthday! :) Happy Early Birthday!!! Thanks for hosting! Hi Amanda: Thanks for the party. I hope you have a great weekend. Happy Birthday, Amanda! I hope you can celebrate tomorrow night after T gets home from work. Thanks for hosting the party. PS- Your kitty cat potatoes rock! Hope you enjoy your birthday donut! Get something with lots of icing and sprinkles on top in celebration! And I loved Courtney's floral lamp, too... so pretty! Happy Birthday, Amanda! A doughnut and mocha are definitely in order and that is just to start your day. I'm always glad to know I'm not the only one with a Saturday working hubby. Sigh! Thanks so much for the party! Enjoy your weekend!! I'm a stay-at-home mom of three kids, a fluffy Pomeranian, and a rambunctious German Shepherd puppy. Happily married to T. We live in Virginia, but I secretly dream of what it would be like to have a place in NYC to escape to for random girls' shopping weekends. Target is my home away from home. I stay sane by doing creative projects around my home and taking lots of pictures. Stick around for realistic inspiration...on a budget! You're Invited to Party Here! 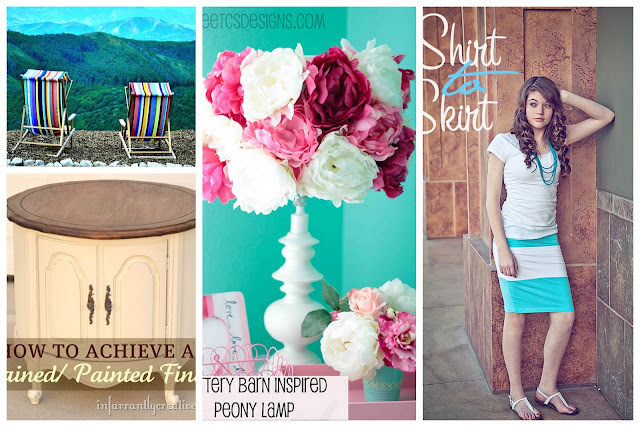 Link up YOUR best post of the week-Every Friday! A Guide to the Essentials, by a Mom of 3! More Highlighted Links--Share Your Best Post! Highlighted Weekend Links-- Share Your Best Post! When Am I Ready to Join a Blog Party? 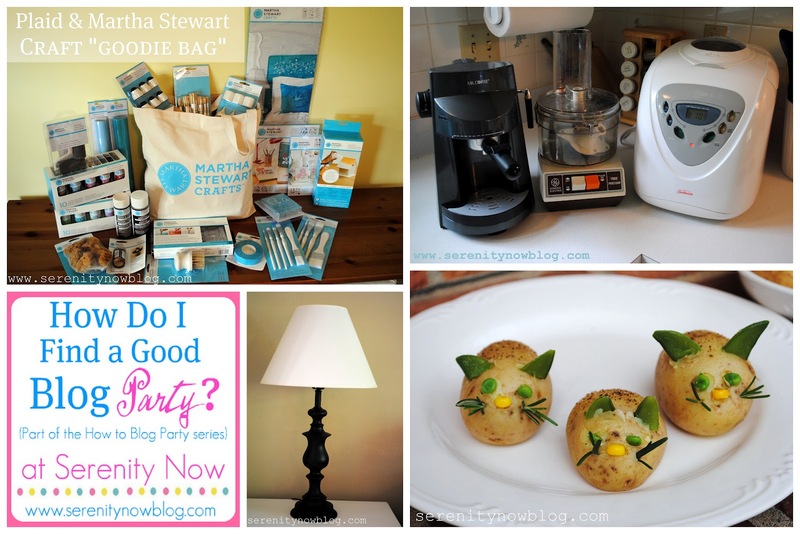 Why Should I Join a Blog Party? All the photos and text on this blog are copyright protected. You may share photos from this blog IF linked back to their original posts and for the sole purpose of featuring my work. Please let me know when you have done so. You may not copy entire articles and posts (even if you link back to me) without my express permission. You may email any such request to amandaserenitynow(at) gmail (dot) com. Please do NOT borrow the pictures to sell your own goods. Thank you!